A truism in sales and marketing is that you have to know what your customers want to buy. The team approach to Inspections is unique in the industry and will enable you to immediately differentiate yourself from the competition and carve your niche out of the home inspection marketplace. But it doesn't stop there; clients and Real Estate professionals alike also appreciate our timely, narrative reports and our unique approach to the walk through. HomeTeam appeals to the ambitious and professional businessperson because it involves working with other professionals within the local business community rather than simply selling products to the general consumer. Organizationally, you'll be light years ahead, too. HomeTeam understands your desire to run a business. Our proprietary training and support gives you the organizational structure to effectively manage, market, and grow your franchise. Thank you for your interest in HomeTeam Inspection Service. 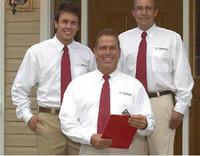 We have an incredible opportunity for you in professional home inspections. The opportunities to succeed with the HomeTeam franchise are better today then ever before. When buying a home, it has become standard practice to have a home inspection before the sale closes. So you've definitely found the right franchise category and in HomeTeam, you've found the right franchise partner. Why are we so confident about that? As with all successful businesses, the key is in the business model. If you have a superior business model, you'll realize success. Invest in a so-so business model - and no matter how hard you work - you'll struggle. So let's strip away all the franchising sales hoopla and take a look at how the HomeTeam business model has you poised for success. You'll be backed by one of the strongest, most-experienced Franchise Development Teams in the business. The wealth of knowledge available to you is truly staggering. We're concerned with one thing and one thing only- your success.